The Profit Maker breed is a multi-breed composite developed by Leachman Cattle Company. The breed is based on research done by the United States Department of Agriculture (USDA) at their Animal Research Service (ARS) at the Meat Animal Research Center (MARC), at Clay Center, Nebraska. The breed is a blend of British and Continental inputs including: Angus, Red Angus, Simmental, Gelbvieh and South Devon. The Breed combines the fleshing ability, marbling, and moderate size of the British breeds with the muscle, milk, and growth of the Continental breeds. As a four breed composite, the breed retains 75% of the F1 hybrid vigour and thus allows producers to crossbreed with simplicity. The MARC (Meat Animal Research Center) started a project in 1973 called the Germ Plasm Utilization (GPU) project. Their research showed several advantages that come from crossbreeding. Most importantly they showed that hybrid vigour has a large impact on beef cattle productivity. The research demonstrated an 8% improvement in weaning weight when a purebred cow is mated to a bull of a different breed. The research also showed that crossbred cows are far more productive than purebred cows. The benefits came in multiple areas including more milk production, better body condition, faster re-breeding, and a longer productive lifetime. In total, the crossbred cows weaned 23% more weight than did purebred cows. Historically, crossbreeding requires the use of complicated mating systems to keep the hybrid vigour effect. Scientists designed rotational systems using three breeds. However, such systems were too complicated. Furthermore, they resulted in wide swings in breed composition, and prevented breeders from having a uniform, well adapted herd. As an alternative, the researchers at MARC developed multi-breed composites. Their study confirmed that such composite breeds retain hybrid vigour in proportion to the number of breeds used – using more breeds generates more retention of hybrid vigour. The Profit Maker® (Marc II composite), with four breeds, retains 75% of the F1 hybrid vigour. Thus, breeders can breed composite bulls to composite females and keep most of the available hybrid vigour without the complexity and loss of uniformity associated with crossbreeding. 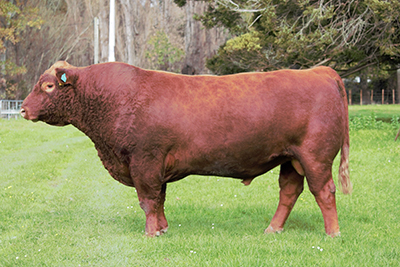 Since 1995, Rissington has marketed over 3,500 Profit Maker® bulls. Customers from across New Zealand are successfully utilizing Profit Maker® to improve their bottom line. The breed is polled and either Black or Red in colour and is also popular and growing globally in the USA, Australia, UK, France and in South America. Our Profit Maker® are fully recorded and part of the Leachman Global Analysis which has over one million recorded animals. 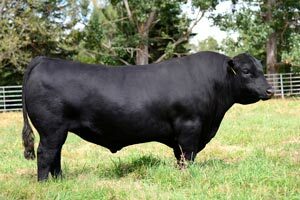 One of resident stud sires Rissington Bullseye 135159 has performed at the top end of the BLG Progeny Test against the best Angus & Hereford bulls from USA, Australia and NZ. Prophet has definitely lived up to his name. When we saw him in the flesh as a young bull we liked him a lot. Not only for his numbers and unbelievable type but also his flawless temperament. He has the ability to move every economically relevant trait in the right direction. 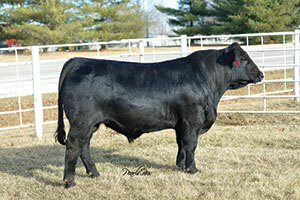 In 2015 Leachman Spring Sale 47 sons sold for an average price of US$10,005! His sons at Rissington spring 2017 were all contracted in advance via our customised breeding program. 18 Karat lived up to his billing selling for a record US$210,000 in the Leachman spring sale 2016 which we were there to witness. We were one of the investors in this great sire. 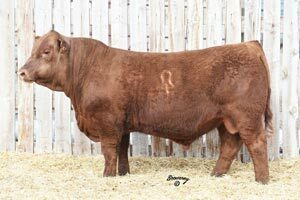 He is homozygous polled and top 1% $Profit & $Feeder! We used him heavily in ET program in 2016 and calved the recipients down in 2017. The progeny were outstanding from the get go and have impressed all visitors in the last 8 months. We bred Bullseye as part of our customised ET program back in 2012. He is a great illustration of why we are part of the Leachman Global analysis. On our previous analysis with CSU he was good without being outstanding which was often the case as the analysis was effectively a mid parent estimate on embryo transfer calves. In 2015 we became part of the Leachman Global analysis and he was identified immediately as a bull at the very top end of the Global Analysis. A further demonstration of the power of this analysis is post this Bullseye has been one of the very top performing maternal sires in the BLG Progeny Test. Apollo is a very interesting Gelbvieh Angus F1 sire. One of the ways we bring the high performing purebred bloodlines into the Profit Maker is via the first cross. This bull is sired by a carcass legend of the Angus breed in GAR Progress and out of a high performing Gelbvieh cow from the Knoll Crest program. No surprises he rang the bell on $Profit with $19,289 index (top 1%).